Previously immersed in remote Indonesian paradise with Silversea, blogger Karen Edwards followed that up with a cruise along Western Australia. Edwards explored the Kimberley region and surrounding areas aboard the Silver Discoverer and enjoyed numerous expeditions through the wild land. And these treks were definitely not sedate. When Edwards visited King George Falls — dual 300-foot-tall waterfalls plunging into a gorge — she opted for and early wake-up and rugged hike to the top of the cataract, as the temperature creeped up to almost 100 degrees F.
It was definitely time to cool down. In addition to a dip in a nearby freshwater pool, a Zodiac tour of the gorge included a refreshing close encounter with the cataract. There was also plenty of local wildlife to see. In the water were eagle rays, dugongs and green sea turtles and on land, agile rock wallabies. The Silver Discoverer voyage began in the Northern Territory locale Darwin, and then briefly ventured to the East Timor, Indonesia destination Jaco Island for a welcome beach barbecue followed by a snorkeling excursion. Major Australian aerial highlight for Edwards included the light-aircraft and shipboard exploration of the unique Bungle Bungle mountain range and Ord River along with the no-door helicopter fly-over of Mitchell Plateau and falls. And then there was the history, spanning thousands of years. Everything from the wreckage of a WWII troop carrier at Vansittart Bay to ancient indigenous rock paintings — an assortment of human figures, fish and mud crabs. Edwards’ final memory of the magical trip was Montgomery Reef, an open-water Zodiac excursion featuring “mini-waterfalls” and a menagerie of turtles and rare Sahul Humpback dolphins. 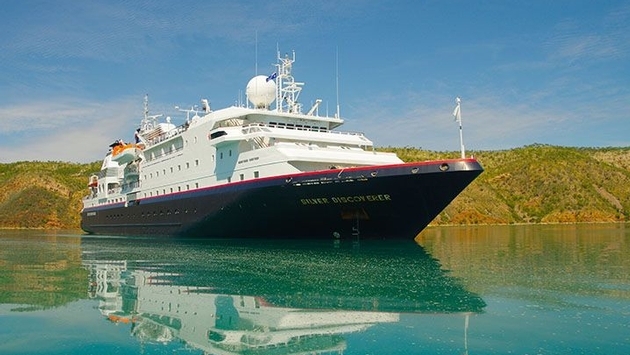 For more on Karen Edwards’ Australia explorations, visit Silversea’s blog.